If you’re one of the increasing number of millennials who are realizing that a traditional 9 to 5 office job simply isn’t going to work for you, let us be the first to say “Welcome!”. The good news is that there are a plethora of excellent paying careers out there that will enable you to enjoy the type of work that you do. If you are wondering where you can find such a career, look no further than hotel management! Work doesn’t have to feel like a back-breaking chore. 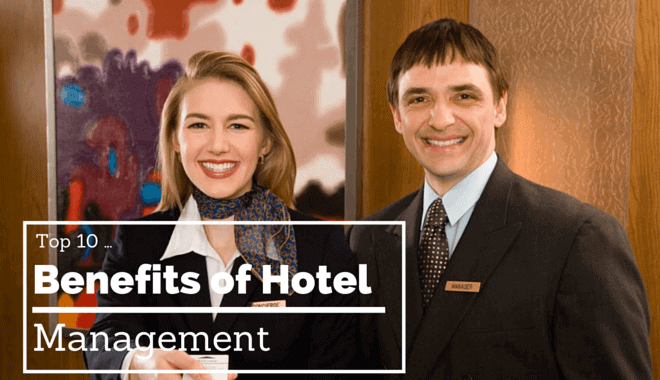 Check out our list of the top 10 benefits of hotel management! If you thrive in a fast-paced work environment, then you can choose to work in an internationally known hotel in a major city. If you prefer a more laidback atmosphere, working in a small bed and breakfast on the beach might be ideal for you. The point is that you have plethora of options to choose from. The hospitality industry is different from any other industry in that the skills and education you acquire will allow you to work anywhere in the world. Most hotels that employ hotel managers are owned by major corporations, like Hilton or Marriott. These companies know what is required to stay in business. A significant component of this is offering excellent benefits and competitive salaries in order to attract and retain exceptional employees and management staff. Not only are 401K and healthcare packages more than competitive, these companies also offer generous sick leave, maternity leave, and vacation packages/pay. Most also offer tuition reimbursement for select educational programs, as well as steeply discounted travel rates. If you work within the hotel industry, there will be multiple opportunities to advance your career, particularly with larger hotel chains. For most companies, internal transfers are always preferable to hiring an outsider who is not familiar with the company culture, and many hotel chains actively encourage their employees to consider positions in other departments that are outside of their field of expertise. Quick promotions to executive management and regional posts are not uncommon. On top of competitive wages, a number of hotels, particularly larger hotels, boast bonus programs that are designed to supplement a hotel manager’s annual salary. In most cases, bonuses will be based upon meeting annual revenue goals and/or customer service scores, in addition to personal goals. It is not uncommon for such bonuses to equal 25-30% of a hotel manager’s annual salary. If you are the kind of person who loves to travel or get bored staying in one place too long, you’ll be delighted to learn that one of the biggest benefits of working as a hotel manager is the mobility it affords you. If you work for a company that owns multiple hotels in the U.S. or internationally, then you can request a transfer to a different hotel every couple of years. It is a common practice in the hotel industry, and there are not many other careers that offer this type of flexibility and mobility. It’s an age-old conundrum that many college graduates face: you can’t get a job unless you have experience, but you can’t get experience unless you have a job. Unlike other industries who demand years of work experience to even obtain an entry level job, the hotel management and hospitality industry offers a wide variety of career opportunities for inexperienced persons who have the right type of training. The hospitality industry tends to value an outgoing personality, dedication to excellent customer service, and a strong work ethic over experience. Don’t laugh – it’s true! At first thought, this might seem like a strange perk to becoming a hotel manager, but take a moment and think about how much money you spend each week on groceries and eating out. The numbers begin to add up. Almost all hotels offer free or reduced price food for their management staff, and you can save a considerable amount of money on food over the course of a year. Most hotel chains offer generous discounts or free rooms to their staff when they are traveling. There are some that will also extend a “friends and family” rate to those who are traveling with you. It’s not uncommon for free additional perks, like a massage or reservations to a well-known restaurant, to also be provided. Over the course of your vacation or travel, these savings can amount to hundreds, if not thousands of dollars. There are only a handful of careers that allow a person to tangibly experience job satisfaction, and hotel management is one of them. The gratitude and thanks that satisfied guests offer give purpose to your work, and there are few things that compare to helping a genuinely desperate guest who is in a bind. In the hotel management industry, you will often be afforded the opportunity to meet all types of interesting people – ranging from famous actors and athletes to professional organizations and clubs. One of the best perks of working in the hotel business is that your daily work environment is constantly changing and evolving, and there will almost always be something new and exciting going on.